Opis: All four blue images in the above photograph are the same object. 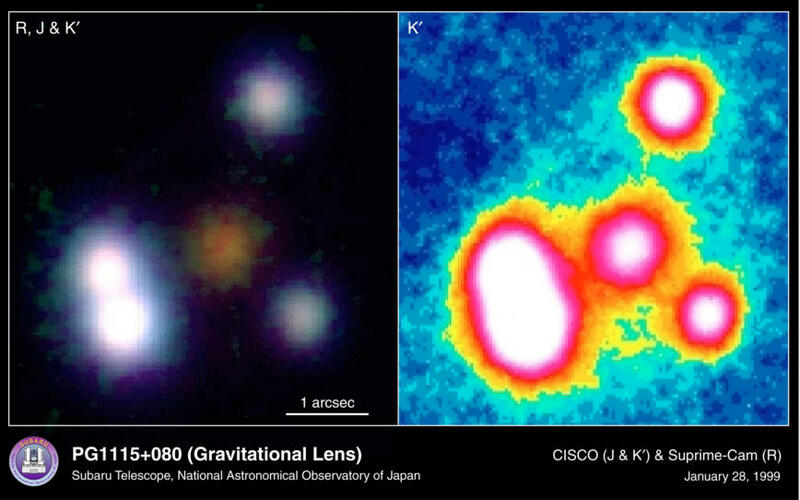 The gravitational lens effect of the red, foreground, elliptical galaxy visible near image center creates a cloverleaf image of the single distant quasar. Light from the quasar is pulled around the massive galaxy in different paths, corresponding to different images. 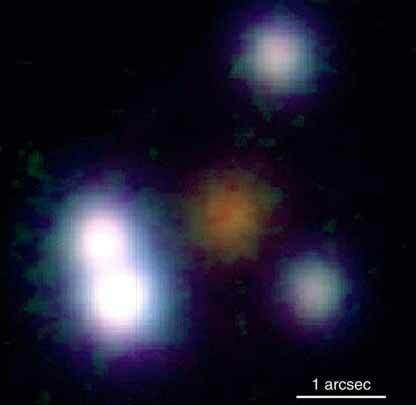 Light takes many billions of years to reach us from this quasar. Since light takes a different amount of time to traverse each path, each image shows the quasar as it appeared at a slightly different time in the past, creating time delays on the time scale of days. Since these time delays are influenced by the expansion rate of the universe, analysis of this image helps reveal Hubble's constant, the parameter that calibrates universe expansion. This recent picture by the new Subaru Telescope is perhaps the clearest image yet of this famous optical mirage.